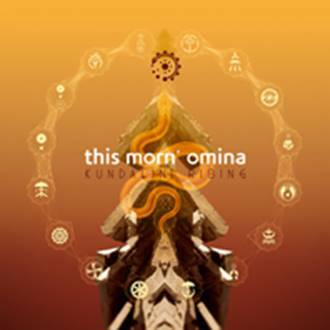 Working on “Kundalini Rising” signalled the departure for new and more varied musical and spiritual realms for This Morn’ Omina. Their last album “L’Unification des Forces Opposantes” was released in 2011 (ANT-ZEN) and marked the completion of their “Nyan Trilogy” which was created over the course of eight years – now it was time for new myths and new visions. When you’re familiar with TMO’s tradition of having a guiding topic for most of their releases, e.g. the subject of reincarnation on “L’Unification des Forces Opposantes”, it’s not far-fetched to associate “Kundalini Rising” with thoughts on apocalypse and its harbingers, but at the same time with possibilities of escaping or counteracting it by the activation of individual resilience or the use of reason. Continuing with this thread of duality, you will find this concept not only in the content of said myths. The most obvious facet of the musical duality that TMO aim to present with “Kundalini Rising” is, of course, the fact that the new record is a double CD with two very different discs. The first disc brings you an ecstatic sound somewhere between Tribal Industrial, Goa, and EBM. If there was an acoustic equivalent to a flickering strobe light, you’d have to issue an epilepsy trigger warning for a track like “Tir Nan Og”. While disc one is ecstatic and forceful, the second one builds up an atmosphere more easily identifiable with the subject matter of the apocalypse. The great opener of disc two, “God’s Zoo”, seems to wind its way into your years in an ominous and, yes, serpentine manner. The sound is getting ever more dragging and abysmal, but no less powerful.